From Alaska with Love: Ensenada Style "Fish Tacos"
update: help us win a trip to Foodbuzz Foodblogger’s Festival by “buzzing” this recipe here! 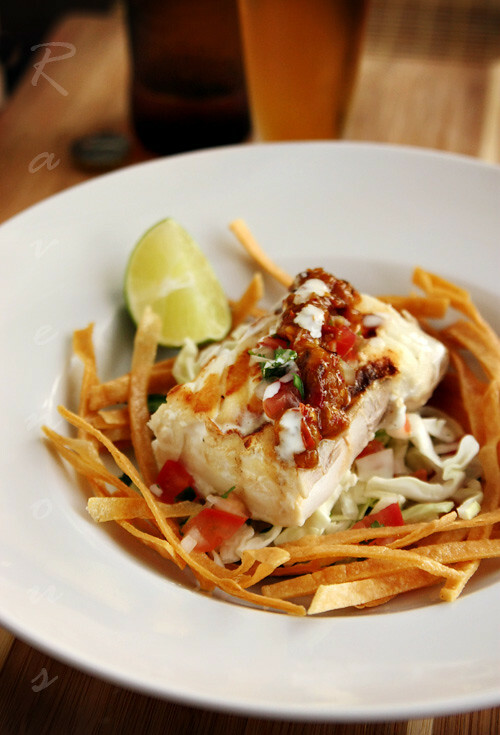 Today we present you with Mexican Ensenada style “fish tacos”…with a twist. We were recently chosen by Foodbuzz and Alaska Seafood with a challenge to come up with a dish using one of Alaska Seafood’s COOK IT FROZEN! techniques that best showcased Alaska’s sustainably caught wild seafood. One of the drawbacks we find when cooking with frozen seafood is that we have to plan ahead and remember to defrost frozen fish. So after a long day, the last thing we want to do is wait a few hours for fish to defrost. The folks at Alaska Seafood must have read our minds because they’ve come up with techniques to literally cook it straight out of the freezer. From poaching, broiling, grilling, steaming, pan-searing and roasting, there’s a simple and quick no thaw technique. So we decided to put the COOK IT FROZEN! technique to the test. Since the only method that this doesn’t work for is frying, we used the next best option, a pan sear to make our “fish tacos”. We’ve been in love with traditional beer battered and fried Ensenada style fish tacos for quite sometime and so when we received the overnight shipment of wild Alaskan halibut filets, we created a dish with all the taste of a traditional Ensenda style fish taco without the frying. For this recipe you’ll need pico de gallo, a white sauce, and a chile de arbol sauce (or if you’re strap for time, use your favorite salsa), sliced cabbage and some corn tortillas. Chile de Arbol are a potent Mexican chile that are found dried in Latin markets and makes a great sauce because of it’s naturally smokey/nutty flavor. All sauces can be made a day or two in advance. We used the COOK IT FROZEN! technique for pan searing. Taken straight from the website: Rinse any ice glaze from frozen Alaska Halibut under cold water; pat dry with paper towel. Heat skillet over medium-high heat. Brush both sides of halibut with oil. 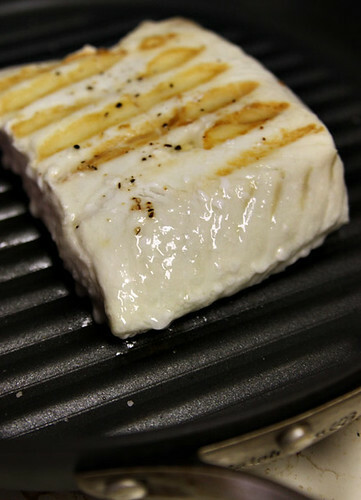 Place halibut in heated skillet and cook, uncovered, about 3 to 4 minutes, until browned. Shake pan occasionally to keep fish from sticking. Turn halibut over and season with salt and pepper. Cover pan tightly and reduce heat to medium. Cook an additional 6 to 8 minutes for frozen halibut. Cook just until fish is opaque throughout. The technique is quite simple but you have to be mindful of a few things. Since our halibut is a rather thick cut of fish, we had to cook it covered under medium heat for closer to 10 minutes per side. So adjust your cooking time to the thickness of the fish. Otherwise, the technique works great! A good trick to test the doneness is stick a toothpick inside the thickest portion, and then bring it to your chin. If you can feel warmth, then it’s done (courtesy of Eric Ripert) Also, a good nonstick pan is very helpful. To assemble, we tossed the pico de gallo with the shredded cabbage plated in center of a plate and added some fried corn tortillas around. 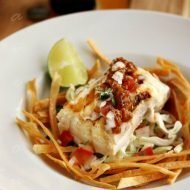 Place the pan seared halibut on bed of cabbage and pico de gallo and top with additional pico de gallo and chile de arbol sauce. Finish with drizzle of white sauce and fresh squeezed lime. Alaska Seafood is a consortium of all of Alaska’s sustainable seafood industry so if you’re looking for seafood options, consider wild frozen Alaskan seafoods as they practice and support sustainable fishing. From the wild seas of Alaska to the bold and fresh flavors of Ensenda, we hope you enjoy this dish as much as we enjoyed the challenge of creating it. Enjoy with a glass of cold cerveza, cheers! Ensenada Style Pan Seared "Fish Tacos"
For the chile de arbol sauce, combine all ingrediants with a light drizzle of olive oil and small amount of salt and pepper to coat well. Roast under a 350 degree oven for about 20 minutes or until the tomatillos get soft. When cooled slightly, add all ingredients into a food processor and blend until desired consistency. Season with lime and salt and pepper to taste. For the white sauce, add mayonaise and skim milk a few tablespoons at a time and mix well to combine. Add more milk until desired consistency--should be slightly runny. Transfer to a squeeze bottle and set aside in the fridge. For pico de gallo, combined the diced tomatoes, onions, jalapenos and season with lime and sea salt and freshed cracked pepper to taste. Set aside in the fridge. 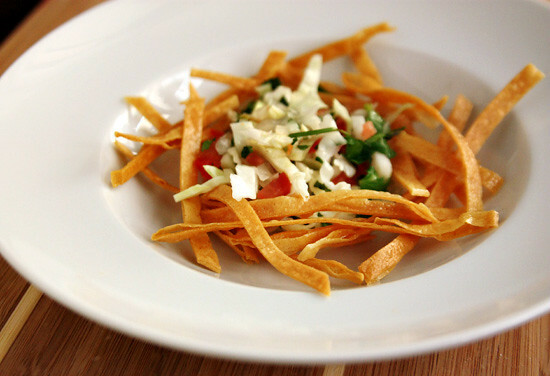 Fry the corn tortilla strips until golden brown, drain, sprinkle lightly with sea salt and set aside. Rinse any ice glaze from frozen Alaska Halibut under cold water; pat dry with paper towel. Heat skillet over medium-high heat. Brush both sides of halibut with oil. 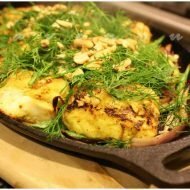 Place halibut in heated skillet and cook, uncovered, about 3 to 4 minutes, until browned. Shake pan occasionally to keep fish from sticking. Turn halibut over and season with salt and pepper. Cover pan tightly and reduce heat to medium. Cook an additional 6 to 8 minutes for frozen halibut. Cook just until fish is opaque throughout. Beautiful post and awesome recipe! I love the photos too. Great explanation of Cook it Frozen! NIcely done. I like this deconstructed fish taco. The halibut looks amazing with the brown sear marks. I'll have to try this frozen method, I have a feeling the fish actually stays more moist than if it was fresh. Mmmhhh, that is a gorgeous dish! The fish looks so good. 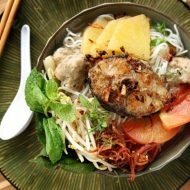 What a beautiful and easy dish! Gotta love that you don't have to thaw! A very elegant "deconstructed" presentation! And the cook it frozen method is definitely very useful (I forget to defrost seafood a lot too). Where's my fork? Im ready to dig in! The fish looks so moist, I can't resist! 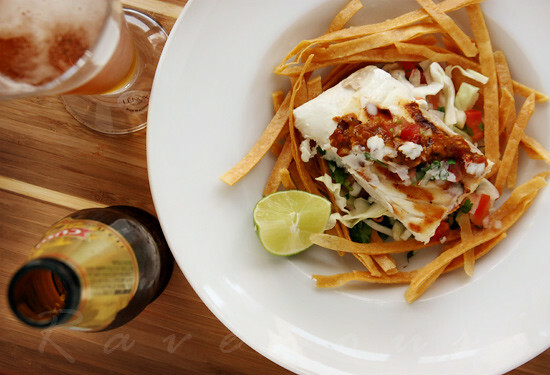 thanks everyone for your comments, we'll post the traditional fish taco recipe soon! Fish Tacos are a favorite and these look fantastic. This Ensenada Vietnam place made me work a little. Looks like its a bit North of HaNoi and way the heck East. This dish looks very appetising and pretty! Great recipe and stunning pictures! This looks amazing!!! Really like the Cook it Frozen techniques. I must try this! really unique idea. i think we're due for an out-of-the-box supper around here. can't wait to try it! Question? Are the measurements correct for the chili de arbol? A cup and a half of those chili's is a lot. This would make it incredibly HOT. I made a similar recipe once and it called for 12 chili's. I dumped in the entire bag (about 25) and the sauce was inedible it was so hot. these look amazing and i printed this recipe out to try it! Those are some really nice looking fish tacos! but didn't do. If you have time please look at it and comment. Just saw that you won the contest, so CONGRATS! Hope to see you at the Festival! Looks great. I missed it!